Circus Wonderland is returning to Horsham with high-flying acrobats, jugglers and clowns promising fun for all the family. The theme of the show will be a celebration of the 250th anniversary of the birth of the modern circus in London in 1768. It was founded by Philip Astley, the trick rider who is regarded as the father of the circus. On a piece of waste ground near Westminster Bridge, Astley roped off a circle to perform his equestrian skills – and also added clowns, acrobats and strongmen in between the horse displays. The circus as we know it was born, and this new form of entertainment quickly spread throughout Europe and across the world. 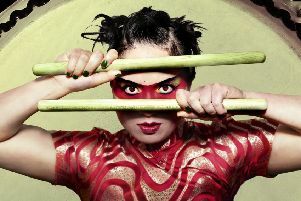 Roller skaters, bouncing bungee jumpers and aerialists will join award-winning clowns Kakehole and Popol, who are promising chaos with their unique brand of music, magic and mayhem. Paul Carpenter, who appears as clown Popol, believes that the 250th anniversary will be a big boost for the UK circus industry. “Circus is our most exciting form of live entertainment,” he says. Circus Wonderland is in Horsham Park until Sunday, July 22. Show times are Thursday at 6pm, Friday at 4.30pm and 7.30pm, Saturday at 12pm, 3pm and 6pm, and Sunday at 12pm and 3pm. For further information visit www.circuswonderland.com or contact the box office on 07531 612240.